Recognizing design that can make people healthier and happier is the goal of a recent awards by The Center for Active Design, an organization launched in New York City in 2013 by the Bloomberg Administration’s Obesity Task Force. This week the Center announced the first every winners of the Excellence in Active Design award competition. The competition intends to publicize and recognize the role of design in addressing preventable disease by encouraging physical activity through the design of buildings and public space. A jury of design and health professionals selected four winning projects and two honorable mentions for the Center for Active Design Excellence award according to the checklists found in the Active Design Guidelines, published in 2010. Preference was given to projects with research studies of proven impact. The jury also acknowledged the extent to which cross-sector and community collaboration were required in order to realize the results achieved. The Leadership in Active Design Excellence award recognizes an early adopter of Active Design with an established track record of Active Design implementation. All winning projects exemplify innovation in the implementation of Active Design, the press release states. The Center was pleased to see projects submitted for review came from regions well beyond its hometown of New York City, spanning the US from New Mexico to Washington, Virginia to Texas, and countries from Argentina to Denmark. This strong showing is evidence that Active Design is growing nationally and internationally as designers are more knowledgeable of the health affects of their work. Award recipients will be recognized at “Celebrate Active Design”, to be held in New York City on May 19, 2014. The fundraising event is open to the public from 7pm – 9pm. For more information on purchasing tickets, please click here. Read on to find out more about these projects! The leadership in Active Design award was granted to Blue Sea Development Company for pioneering the implementation of Active Design strategies in affordable housing. The company’s case studies and financial pro formas were instrumental in informing the Active Design: Affordable Design for Affordable Housing publication distributed by the Center for Active Design. “Arbor House,” a low-income rental building completed in the South Bronx last year, uses all of the applicable Active Design strategies. In addition, it addresses the lack of access to healthy food in this neighborhood by integrating a 10,000 sf hydroponic rooftop farm, which will function as a community supported agriculture (CSA) arrangement in which “Arbor House” residents can purchase shares of healthy food produced by the farm. Mount Sinai Hospital is conducting a formal evaluation of “Arbor House” to assess the impact of Active Design and other health-related strategies on the well-being of its residents. The Buckingham County Elementary School, designed by VMDO Architects, P.C., re-defines education for its 960 elementary students, serving the residents of Dillwyn, Virginia. This existing rural community, sustained by the timber and industrial farming industries, offers little access to fresh, healthy foods or parks and paths for play and activity. The project team aimed to provide increased access to healthy foods and hands-on nutrition education, as well as create places for physical activity. In the long term, they hope to shape the way today’s youth think about physical activity and healthy eating choices as they age. Inside the school, a teaching kitchen and food lab lounge instruct children on good nutrition and healthy meals in a fun and interactive environment. The kitchen garden offers a variety of raised bed heights for users of varying abilities and heights. A grab-n-go garden adjacent to the play areas facilitates healthy snacking right off the plant. While working on the project, the team developed Healthy Eating Design Guidelines for School Architecture, published by the Center for Disease Control. The project uses Active Design strategies reflected in the Active Buildings, Active Recreation, and Healthy Food Access approaches. The naturally lit lobby stair connects two shared common spaces and functions as a social hub. Ergonomic seating designed for micro-movement goes against traditional instructions to sit and be still, instead allowing children to fidget, lean, and sway as they participate in hands-on learning activities. Additional furniture options encourage active postures. 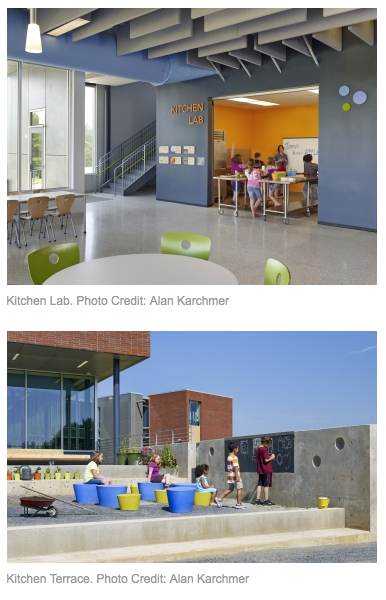 Circulation patterns, integrated way-finding graphics, and visual access to the commercial kitchen in the cafeteria connects children with food preparation and service. Outside, 15 acres are designed for intergenerational use, with fitness and movement opportunities co-located alongside learning spaces, including a sustainable garden for public and school use. BKSK Architects renovated and expanded Brooklyn’s aging Sephardic Community Center. The renovation and expansion payed special attention to preserving the legacy of the original building and while creating new spaces for a range of educational, athletic, and social service programs. The completed project serves preschoolers, school-aged children, young adults, adults, and senior citizens. The Sephardic Community Center’s greatest Active Building innovation is the use of the central stair as the focal point for the community. Design of a 5’-8” wide central lobby stair connects the building’s three stories and encourages social mingling. Easy navigation and visible opportunities for rest or social engagement are fostered with comfortable seating on stair landings. Natural light is funneled into the core of the 100,000 square foot building. Elevators are located less prominently but nearby. The Sephardic Community Center also uses Active Design strategies reflected in the Active Recreation approach. The building includes a gym, fitness center, racquetball courts, flexible program rooms, and an Olympic-sized swimming pool. The most frequented program space is the fitness center on the second level. Translucent partitions combine what were once visually and distinctly separate rooms. Boards display information on classes, health and nutrition, and community activities. Externally, the glass-walls open up the building to light and energy..
Blue Hole is a natural spring-fed swimming hole and a treasured destination for visitors and residents. Years of unmanaged recreational activities damaged the site and ecosystem, leading residents to decide to transform the site into a regional park. A design team led by Design Workshop, Inc., including Taniguchi & Associates, was asked to develop a new park to accommodate visitors, restore damaged ecosystems, and reflect the local vernacular cherished by the community, while minimizing environmental degradation. The design team worked with the community through public visioning charrette. The park now supports active and educational uses with soccer fields, basketball courts, playgrounds, camping sites, and swimming in Blue Hole. The design manages to preserve seventy percent of the area’s tree coverage, which provides shade for outdoor active spaces. Nearly five miles of recreational trails were added, including a connection to the regional hiking/biking trail. Pedestrian routes to spaces within the park were made safe, visible, and well-lit. The project is one star SITES Certified and the largest SITES certified project in the nation. To encourage children to move, the design team created nature-based play features made from re-purposed materials found on-site, such as a limestone interactive water table, a sand pit, and “Cedar Teepees” formed with upside-down cedar roots. A particularly notable achievement, the Awards committee points out, is the design team’s ability to protect 96% of the area from development while adding 320,000 square feet of active programming. Post-occupancy surveys show a 116% increase in average user satisfaction. A record 37,000 park visitors enjoyed the site between Memorial Day and Labor Day during the summer of 2013. Blue Hole Regional Park is a role model for developing human use with sensitive ecological preservation. The Greenbridge Master Plan mixes housing with recreational facilities. Upon receiving a HOPE VI grant from the U.S. Department of Housing and Urban Development, the King County Housing Authority commissioned GGLO to develop a plan for the revitalization of an existing 100-acre affordable housing site in Seattle. Major challenges for the site included a walkable design that fit within the context of the existing diverse, low income, low-density neighborhood. The challenge grew even further with the goal of transforming the single-use residential configuration into a vibrant mixed-use neighborhood. Designers commissioned over twenty art elements. Art is located in relation to the reserved existing trees to enrich sensory cues that support walkability and create nodes for community gathering. A number of regulatory changes were required by King County in order to accomplish the desired design outcome. An innovative Demonstration Ordinance, supported by King County, enabled a number of variances to Land Use and Building Codes, and allowed for several alternative design solutions to achieve affordable housing in a low-impact development. The Greenbridge Master Plan integrates Active Recreation and Active Transportation strategies. 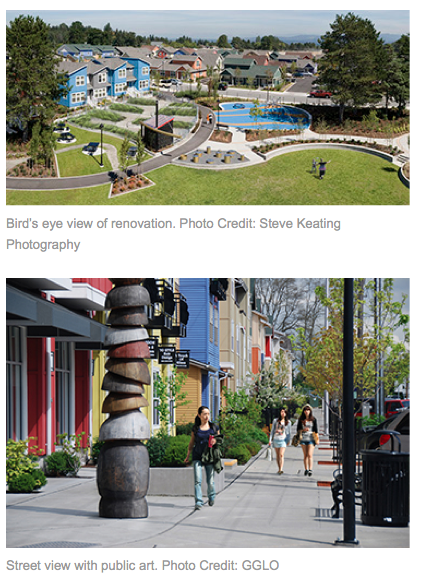 To support the livability and health of residents, the design team focused on four elements: connectivity; open space diversity; adjacent uses; and placemaking. A variety of pedestrian routes pass by many types of destinations and encourage residents of different ages and abilities to walk instead of drive. Open spaces ranging in size, such as community parks, food gardens, and pocket parks, are located throughout the site and connected by sidewalks, trails, and paths. These recreation spaces are also located alongside adjacent uses, such as homes, schools, and community centers, which put “eyes on the street” and increase safety. 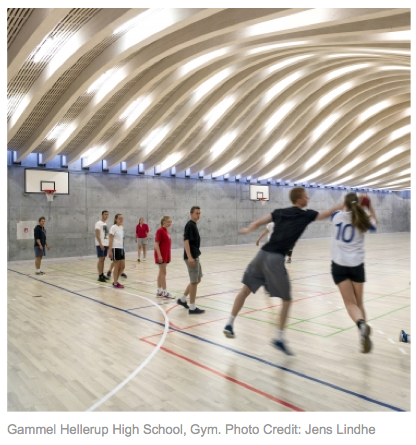 The Gammel Hellerup High School Gymnasium, designed by the BIG-BJARKE INGELS GROUP, is a response to the local high school’s request for a multifunctional space in which its students could engage in physical activities and socialize. Wishing to have the facility placed in its existing courtyard while maintaining sight lines and connectivity with the 1950’s-era school building, BIG’s solution was to build the gymnasium sixteen feet below ground. Inside, sports are the typical activity in the 12,500 sf space, and the school has experienced an increase in high-caliber athletes applying for admission. The space is also equipped to serve as a multipurpose venue and can accommodate a variety of large group gatherings, from academic to social opportunities. Incorporating Active Recreation strategies was rather straightforward due to the required program. The innovation came with the implementation of Active Building strategies. The sloping roof of the gymnasium is an accessible, dynamic area for social gatherings and acts a large hilly schoolyard designed with a “molehill” peak. This creative plan transforms a historically underutilized courtyard. White furniture is affixed to the curvilinear roof in distinct areas, which offer informal congregation spaces. These are routinely used for class activities as well as social purposes. A new entry to the school removes the preexisting barrier between neighboring community, which has enabled the school to host community events. 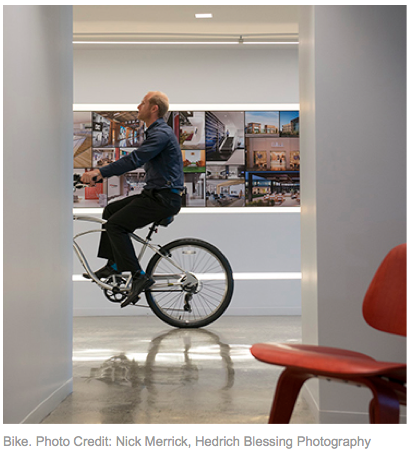 Gensler realized the firm’s “Healthy Workplace Initiative” through the extensive renovation of their own office space. The Initiative is the result of Gensler’s workplace research, captured in its Workplace Performance Index developed to record office behaviors to increase employee health. The office was programmatically organized to encourage employees to actively move about the office throughout the day. Company-owned scooters, bikes, and sometimes skateboards are routinely used for inter-office travel. The production room is on the first floor and the break room on the second. Recycling and trash bins have been removed from individual desks and centrally located instead. Additionally, recognizing that certain types of work are produced better in different environments, the open office plan provides places for focus and collaboration. This further encourages staff to move away from their desks and into alternative work environments throughout the day. The firm has established follow up evaluation systems to track the impacts of these strategies on employee health. The “Healthy Workplace Initiative” was launched to assist corporate clients who seek to improve the wellbeing of their employees. For more information, contact: Joanna Frank, Executive Director, (646) 568-7924, joanna@centerforactivedesign.org. This entry was posted on Tuesday, April 22nd, 2014 at 9:53 pm and is filed under Community, Green Building, Health, Land Use, Landscape+Urbanism. You can follow any responses to this entry through the RSS 2.0 feed. You can leave a response, or trackback from your own site.